After the collapse of the Soviet Union, Russia Army declined until President Putin took over. Taking advantage of rising energy prices Putin increased Russia GDP and rebuild its Armed Forces. Forbes Magazine choice for the most influential leader in the world was Putin for 3 years in a row. Today Russia is the only political and military power who can talk with the USA on a parity level. You are rushing with judgement - Cold War II has only started, let's talk about it in 5-10 years. Reactions: LVV, SeaAb and hola! 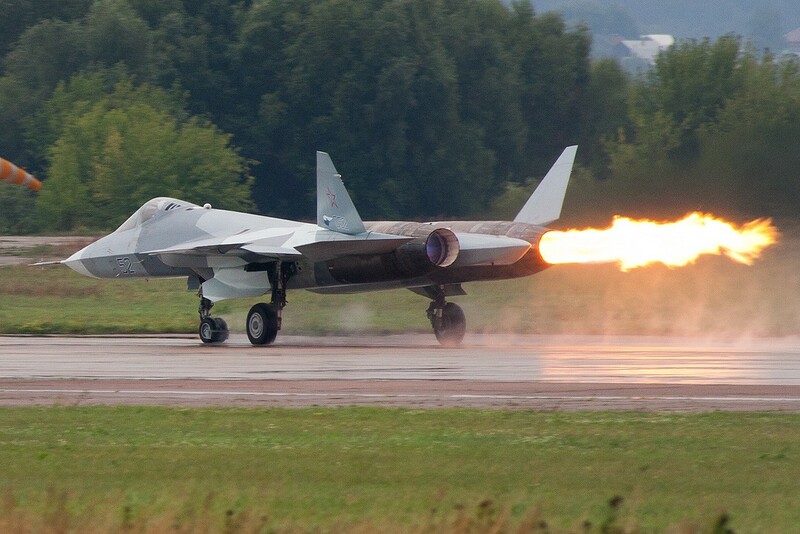 Russia’s new T-50 stealth fighter is fast, maneuverable, heavily-armed and hard to detect on radar. In theory. But according to Indian air force officials, in practice the Sukhoi-made stealth jet is also too expensive, poorly engineered and powered by old and unreliable engines. The Indians’ complaints illustrate the yawning gulf between stealth warplane design and the actual production of radar-evading jets. In other words, it’s one thing to sketch an advanced warplane on paper. It’s quite another to build one and get it to work. All new aerospace development is difficult and many planes get poor reviews early in testing. But the gripes coming out of New Delhi are particularly worrisome for the Russians. Sukhoi is working on two variants of the T-50—one for Russian use and another for the Indians. The Indian air force has ambitions to purchase 144 of the stealth jets, and the money from this sale underpins the entire T-50 development effort. New Delhi is also kicking in $6 billion for design work. Without the Indians’ cash, there wouldn’t be a T-50. And Russia would have basically no hope of acquiring a stealth jet to counter the Americans’ F-22s and F-35s and Chinese J-20s and J-31s. The Russian version of the T-50 is reportedly simpler than the Indian version, which includes Indian avionics and a wider range of compatible weapons. Five Russian T-50 prototypes are flying. The Indian model still exists only on paper. The AL-41F engines currently fitted to the T-50 are unreliable. The radar is inadequate. The airframe is poorly built, with serious implications for the jet’s stealth profile. And in light of these defects, $6 billion is too much to pay up front. According to Business Standard, Russian officials countered, saying the AL-41F engines are a temporary fit until brand-new and more powerful motors can be developed. The radar, too, is temporary—pending new sensors being developed specifically for the Indian version of the warplane. But the allegations of sloppy construction appear to be particularly serious. Besides posing an accident risk, low-quality construction can result in gaps and mismatched angles that elevate a plane’s radar signature. Press reports in 2013 indicated that Sukhoi was having problems with quality control in the T-50 effort. At least one of the prototypes needed patches on its wings to keep from falling apart during high-stress maneuvers. All the same, Business Standard speculates that the Indian complaints could be somewhat politically motivated, as New Delhi is also planning to buy 126 new Rafale fighters from France for an eye-watering total price of $18 billion. Scrapping the T-50 could help India pay for the French jets. This is natural every plane has it's problems see the F35 it is still not cleared for major operations and it the future of US Air Force if you compare it to T50 it is like a lion against the fox. The T 50 is faster, much more powerful in dogfight, the only plane who can face it is the F22 which will not get produced again. Russia is building 150 new planes every year ( 20 Su34, 25 Su30, 12 Su 35 and Soon 12mig 35 in addition to upgrading 10 Mig 31 , 10 Su 25 plus 6 T22m3 and 6 bears Tu 95. Russia had developed the k 101,k102 to be used by its strategic bombers, stealthy cruise missiles with a range of 5000 km at least , plus the BVR AA missile with a range of 300 km plus K32 supersonic used by the blackjac ; the US has nothing equivalent specially with the development of Zircon in 2018 the fastest attack missiles in the world 5 6 Mach. The F 35 by comparison is a very modern plane but not operational until know , a sitting duck while the F15,F16 and F18 are becoming close to the end of their service. Russia made a smart choice going from 4 generation to 4 ++ generation than to 5 , the USA directly to 5 with the result that the F35 is still not ready for major operation. Russia will receive next year 12 T 50 who will be operational and ready for combat not like the F35. Russia has ordered 100 tanks for 2017, this Tank is the best in the world, a fact acknowledged by the West. Soon it might receive a 152 mm cannon. For know according to Forbes, Putin is the most powerful leader in the world. Russia rebuild armed forces and his leadership is the cause of this choice but I hope Hillary get the title also soon because she will be a great and forceful leader. Russia and the US should not fight, they should be allies against China and Radical Islamist terrorism. Both belong to the same culture and civilization. We cannot tell till they both fight among each other, this has never happened. But so far the Americans have a better military technology . So to answer the question in this thread. Yes i think nowadays, political and military Russia is mostly equal to the US. The Syrian war proved so. In my opinion it all started after the August 2013 chemical Ghouta attacks. If you guys remember well, the US and France at the time went nuts over the "alleged" use of Sarin in attacking Ghouta. Kerry and Hollande in several speeches made it clear that they will attack Syria and force Assad to step down by military power. Rebels were rejoicing at the time. USA and France even sent warships and aircraft carriers to the Mediterranean. At the time, China and especially Russia stood firm. Moreover, the Russians sent their Caspian sea fleet to the Mediterranean in a clear stand off with the west. Hours after Kerry's famous "air strikes on Assad" speech, Sergey Lavrov announced that Russia had suggested to Syria that it relinquish its chemical weapons, and Syrian foreign minister Walid al-Moallem immediately welcomed the proposal. This incident alone, should answer the question here. Depend in what Us has better avionics electronic hardware but Russia better in Counter Electronic and missiles technology. What criteria did Forbes use to draw this conclusion - personal power over his subjects or power of his country as it stands within World powers? Depending on the answer I might be able to agree with Forbes too. Forbes base its decision on the impact of the leader action for while Us has more resources, Putin was a more forceful leader who was able to occupy the Crimea, Eastern Ukraine and to impose his policy in the Middle East at least partially while he remained immensely popular at home and his country is recovering from recession. Second about the Cold War, the situation is totally different from 1989. First Putin is not Gorbachev he is a popular forceful leader who increased his GDP by 10, defeated terrorism inside Russia even at the price of destroying Grozny and to kill hundreds of thousands of people. In addition to his foreign policy but Syria is not Afghanistan, Russia is not bleeding there plus while the Soviet Union was unable to reform and his military budget was 40per cent of its GDP. Russia military budget is 5 percent of its GDP. Plus there is not a Ronald Reagan, a Tatcher and a John Paul 2 to defeat the evil empire. Putin might be perhaps a corrupt dictator but he is a great leader who is loved by his people and respected by a lot of conservative people in the West .